November 9, 1960 marks the date that the first Watusi cattle ever to enter the United States arrived. In a cooperative effort between the Copenhagen Zoo in Denmark and the Catskill Game Farm of Catskill, New York, two young bulls, one speckled red and white in color and one solid red were the first to arrive. They were born in Scandinavia of parentage direct from Africa generations before. The Catskill Game Farm propagates many, many breeds and species of animals but also opens a public exhibit during the summer months. 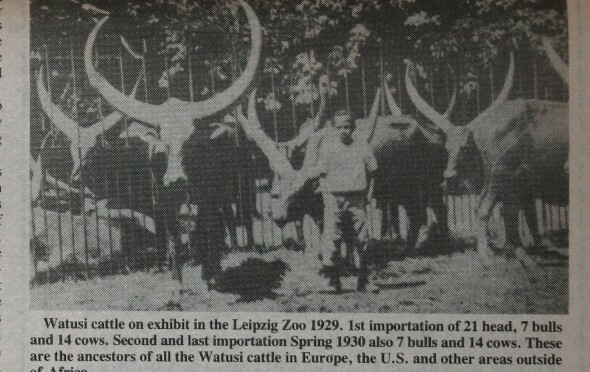 At that time the Watusi were a new and unique addition to their exhibits. There were no female Watusi to go with these males until November 27, 1963 when a red cow with a few small white spots was brought in from the Alberta Game Farm at Edmonton, Alberta, Canada. This cow had been born at the Chester Zoo in England on July 7, 1961. At the time that she came to Catskill Game Farm she was pregnant and on February 23, 1964 she gave birth to a heifer calf. The birth of a heifer was fortunate as more cows were needed to continue with the Watusi propagation project. On May 23, 1965 the Alberta Game Farm cow gave birth to a solid red bull calf which then became the first born of actual Catskill Game Farm breeding. As the breeding program progressed an outcross bull was brought in from Alberta in December of 1973. Other than this the entire herd has been built from the one original cow and her daughter. As Watusi breeders we sometimes need to reflect back on the very small beginnings and limited supply of breeding stock available in our country. As time went on there were various importations of cattle that were brought in from the Scandinavian countries or from England in the late 70’s and early 80’s, never in large numbers. We can be proud to have come as far as we have with our Association and the registration and documents of it’s cattle. We can be thankful to the people who had the forethought to bring any of these cattle to the United States in the first place.